Regulate potato farming to increase crop returns,cs urges – Kenyatta University TV (KUTV). All Rights Reserved. Agriculture Cabinet Secretary Mwangi Kiunjuri has called on members of parliament to fast track laws set to regulate packaging and pricing of English potatoes as one way of increasing returns from the crop. The law currently before the National assembly targets to wipe out middle men who have for a very long time exploited farmers by buying the produce in extended bags. The cabinet secretary stressed that his ministry has identified potato as one of the key crops that can effectively complement maize as a driver of food and nutrition security and therefore with legal loopholes its will bring the crop production to it’s knees. 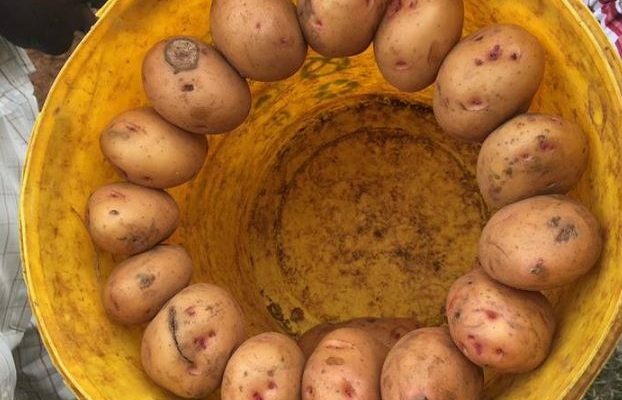 The bill will regulate unregulated imports of Agricultural products including ‘contaminated’ potato seeds from foreign countries which are tormenting the Agricultural sector. “If we allowe importation of diseased material s we will contaminate our souls and affect the production of the crop,”said Kiunjuri. The CS made the remarks while addressing the National Assembly delegated legislation committee on Agriculture, that was deliberaing on the Irish Potato legislation 2018, in Mombasa. “There has been loopholes in the Potatoes regulations in the country and with a law it will streamline the sector.We should be gazetting these regulations to bring order to the sector,” Kiunjuri said. Kiunjuri said the legislation will tackle the legislation and regulation on weights, measures, market fees and levies across counties and increase supply of certified seed potato and strengthening of certification services. “The new framework will help also improve co-ordination and linkages of value chain actors, strengthen market infrastructure and governance to streamline handling and marketing of potatoes,”Said Kiunjuri. Equally, it will support development of Micro- Small and Medium Enterprises (MSMEs) in potato and facilitate inclusion of socially vulnerable groups. Kiunjuri said that for the country to double its value of production estimated at Sh50 billion in 2016, there are a number of challenges that needs to be overcome. These include the low yields of 10 tonnes per hectare compared to an achievable yield of over 30 tonnes per hectare, the limited supply of quality seed and the over- dependence on rain. Other challenges include the poor agronomic practices and pests and diseases. The CS said local farmers get poor returns as a result of high cost of production and uncoordinated marketing activities and poor road infrastructure.